Suspect a Loved One Is Being Abused or Neglected in a Nursing Home? As much as most of us want to take care of aging family members, this is often outside the realm of possibility for a wide variety of reasons. Often, these reasons are attributed to health conditions that require around-the-clock care and attention that family members just cannot give. For these and other reasons, loved ones seek the help of long-term care facilities to care for their elder family members. Unfortunately, instances of elder abuse in these types of facilities are on the rise. If you suspect that your loved one is being abused and/or neglected in a nursing home or other care facility, then it is imperative that you seek the professional services of an experienced Philadelphia nursing home abuse lawyer today. Adam E. Grutzmacher is a local Philadelphia personal injury attorney who has dedicated his career to helping those who have been wrongfully injured. Since 2005, Adam has successfully represented several fellow citizens, including helping a client secure the largest civil settlement ever recorded in Pennsylvania history in 2013. Adam is passionate about seeing that justice is served, no matter the circumstances. He will learn all of the details about your situation and build a strong case that will hold your loved one’s abusers responsible for any and all damages he or she has suffered. Physical abuse. While it is true that elderly people bruise easily, this does not mean that you cannot tell if your elderly loved one is suffering physical abuse at the hands of their caretaker(s). If you notice any consistent bruising, particularly in strange places (like the neck and shoulders area), then it might be a good idea to start keeping track of when and where you notice these bruises. Contact an elder abuse attorney immediately if your loved one shows any blatant signs of violence and get them to a safe place as soon as possible. Verbal abuse. Any insults, threats and other verbal bullying or coercion will be considered elder abuse in the eyes of the law. This type of abuse is meant to degrade a person’s character, which in turn can break his or her spirit. If you notice negative behavioral changes in your loved one since their admittance to a nursing home, then it might be prudent to start doing some investigative work to understand why. Neglect. Elder abuse does not always occur by an action, it can occur due to inaction as well. When caretakers completely ignore the needs of their residents (such as timely medication administration, bathing etc. ), this is considered neglect and can result in an elderly loved one suffering a wrongful death. Caretakers found guilty of neglecting their patients will face severe consequences, especially in the event of wrongful death. Elder abuse is every family’s nightmare when admitting a loved one into one of these facilities. If you suspect that your elderly family member is suffering at the hands of his or her caretakers, then he or she deserves help. The first line of defense is you and other family members, the other is an experienced and professional Philadelphia nursing home abuse attorney like Adam. When Is a Nursing Home Liable for Elder Abuse? So, you have learned (or suspect) that your loved one is being abused or neglected at a nursing home. Who do you hold responsible? Well, potentially a lot of people. Depending on the circumstances, you may be able to hold the facility responsible as well as any and all employees who took part in the abuse. As in premises liability cases, nursing homes and other similar long-term care facilities have a certain “duty of care” to each and every resident of that facility. Basically, this means that the facility owner has a civic duty to ensure that everyone in that facility is safe. When someone is injured because of negligence on behalf of a facility, then that facility can often be held liable for injury or wrongful death of an elderly resident. In addition to the above instances, nursing homes can typically be held liable if there is substantiated proof of abuse and neglect on behalf of its staff. For example, you can include a nursing home on an elder abuse claim when a resident has been deprived of basic living necessities (such as food, drink and hygienic needs), or if staff failed to administer a resident’s medication or unlawfully restrained a resident — among other examples. Whenever families put elderly loved ones in a nursing home, it is usually not out of malice or trying to set them apart from the family or the world — it is because they care about their wellbeing. They are entrusting nursing home and other long-term facility caretakers with invaluable members of their family because they are not equipped to take care of them. Sadly, this trust can be abused along with the elderly in these settings. This cannot be allowed to stand. 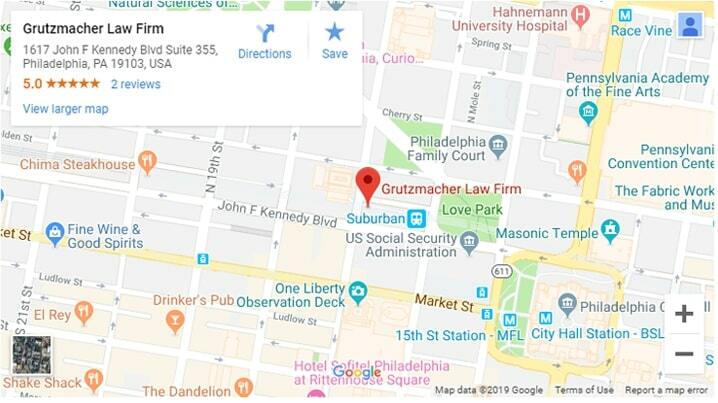 When you choose the Grutzmacher Law Firm, Philadelphia nursing home abuse attorney Adam will do everything in his power to ensure that it will not stand. If you would like to start having some peace of mind about your situation, then please contact us by calling (215) 261-7975 or contacting us online to schedule your free consultation today.